20th Year Anniversary (DIGITAL ONLY) RELEASE of LAURIE GELTMAN'S first full-length album Departure. Her first full-length album, Departure (1992), won enthusiastic praise from critics and fans alike, thrusting Laurie Geltman into the local music spotlight and landing her a prominent place in the Boston Music scene for many years to come. Departure blended soulful vocals and accomplished musicianship into a unique sound. The critically acclaimed album showcased a cross-section of Geltman's songwriting styles and her production know-how, as she brought together some of the area's finest musicians to enhance her vision. She worked with producer Tom Dube on two tracks, David Doms and Ducky Carlisle on most of the others and produced the Rolling Stones classic "Sway" herself. That track also appeared on Botown Records CD compilation BOSTON GETS STONED. "Departure is a strong rock and roll, singer-songwriter triumph... filled with unusual textures and tight arrangements, the album features Geltman's superb acoustic guitar and vocals." 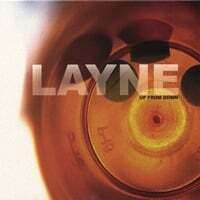 Layne is an amorphous band born from years of relationships with fellow musical travelers who for one reason or another found themselves in Los Angeles. The record features a cadre of top musicians and the live band is a collective of some of those players collaborating with new faces. But at the heart of it all is rock singer-songwriter-guitarist Laurie Geltman, who hungered for a return to her front-person role after a couple years touring as a solo artist. Up From Down finds Laurie indulging in a punchier pop-rock feel while the songs are left bare enough to showcase her raw emotion and soul. As a songwriter with three critically-acclaimed solo albums under her belt, Geltman's wordly-wise vision of love, death, faith and friendship results in songs that mix "resignation with defiance and a cool-eyed observational power..." [Boston Phoenix] A perfect example is the title track, where Laurie sings her most defiant lines with a deceptively vulnerable voice: "But I'm ready to rumble / got no time to stumble / this time I won't fall, this time I can't fall / up from down / it's the only way out..."
"We'll throw a party in your honor / since you're drinking again," Laurie sings on Milwaukee, another one of those "killer lines" that says so much in just one short phrase. It's moments like these that ensure that her fans feel a real connection with the music that keeps them coming back for more. "Up From Down" is vintage Geltman, filled with raucous guitars and remarks both wise and wiseass." Released in 2002, this enhanced CD also includes a six minute documentary combining behind-the-scenes and live footage of the show as well as interviews and rare footage of Laurie. Recorded at the legendary Club Passim in Cambridge, MA., the all acoustic CD features a dozen guest musicians including Jimmy Ryan (Catie Curtis), Jim Fitting (The The, Treat Her Right), Mike Rivard (The Story) and Trina Hamlin. "Since establishing herself as one of Boston's premier singer/songwriters, rock guitarist Laurie Geltman explores her softer side on her latest album, Motion Pictures. Able to shift effortlessly between full-blown rock and sweet acoustic styles, this new disc is pure acoustic--mesmerizing in its simplicity. Recorded live with the One Night Stand Band, the studiolike session gives this folky disc both polish and spontaneity."